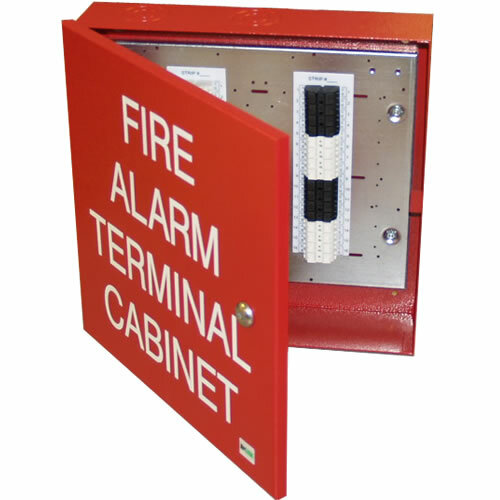 The IF2 32 point "FIRE ALARM TERMINALCABINET" is designed to enhance your fire alarm systems. Ideally suited for trouble shooting and maintenance with easy identification of system wiring. This surface mount cabinet is fabricated from 16 gauge steel with a durable, baked on, red textured powder coat finish. White 2" highly visible lettering and a "lift-a-way" hinged door contribute to fast cabinet location and access. The door incorporates a high security CAT 30 keyed door lock. The IF2 is UL listed for life safety. 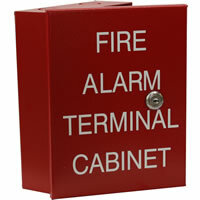 White 2" indelible lettering "FIRE ALARM TERMINAL CABINET"
The IF2 Point Terminal Cabinet is constructed of 16 gauge (.062 thick) cold rolled steel and finished with a durable red textured, heat-resistant baked-on enamel finish. 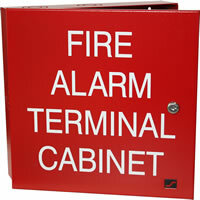 The front cover is engineered with a removable formed lift-a-way hinge and displays "FIRE ALARM TERMINAL CABINET" in 2" white screened indelible lettering. A CAT 30 keyed door lock secures the front cover. The interior of the box has field identification labels on the inside cover corresponding to the terminal strip’s labeling inside the back box. Overall dimensions measure 14" wide by 14" high by 3 1/4" deep. 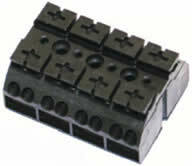 The cabinet includes 1/2", 3/4", 1", 1 1/2" and 2" EMT knockout clusters on the top, bottom and left side. Interior multiple 4 circuit TTS terminal strips are rated for 12 gauge wire and 20 Amp max 250V (Class B/UL) 300V (CSA). 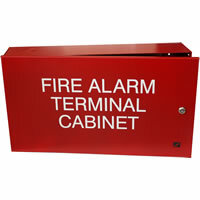 The IF2 32-point fire alarm terminal cabinet is designed to enhance your fire alarm systems. Ideally suited for trouble shooting and maintenance with easy identification of system wiring. Q: do the terminal cabinets ship with terminal strips inside?